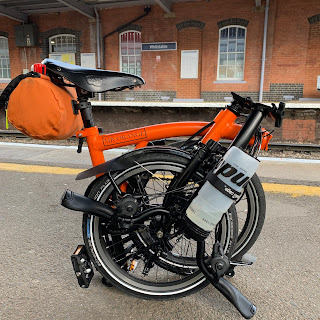 My Orange Brompton: No lights. Are you mad?! I have written about this before but I do wonder why so many cyclists decide to cycle choose to ride their bicycles without lights? On my way home yesterday this evening (when it was snowing) I saw several cyclists with no lights and strangely no reflections of any type. Added to this many wore clothing that was dark and devoid of any reflective elements. This rendered them almost invisible until car lights shone on them. Now I know what you might be thinking - were they youths on mountain bikes doing wheelies? The answer is no they weren't. They were what I would describe as commuters. One was on a mountain bike, two on hybrid bicycles - steel yourself for this - and one was on a Brompton. The Brompton rider shocked me the most. He had no reflectors, lights and his tyres had no reflective sidewall whatever they were? With a set of 'be seen' lights costing under £10 or less there really isn't any excuse. I know the police have more important things to do but I watched one of the hybrid riders and the Brompton owner (letting the side well and truly down) pass a police vehicle at a set of traffic lights and cycle through a red light. They didn't do anything, despite definitely seeing them. I love my dyno lights all year round, I must admit, but I stuck a Volt400 on the bars as well for city commuting in the winter. The weird pattern I've seen in Cambridge lately is red on the front, white on the rear. I just ... can't understand what kind of mindset results in that. On one bike, fair enough, it's a mistake or a Statement or something, but I've seen it on eight or nine so far this year.